Hello again, folks! 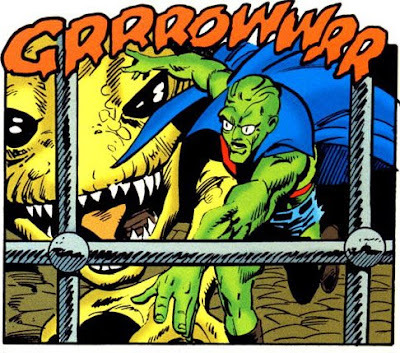 Time for the second installment in our portion of the Paul and John Review/Living Between Wednesdays crossover tribute to our favourite dead Martian, J'onn J'onzz! 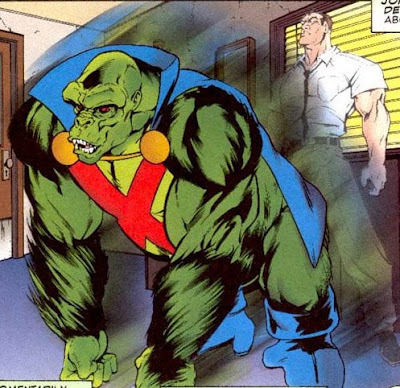 Today, I'll be looking at some of the Manhunter's different appearances in Elseworlds yarns and what have you and trying to review how he looks instead of the book as a whole. Easier than you think, though, because I haven't read some of this stuff yet. 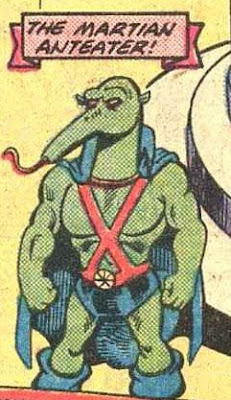 For comparison, here's J'onn J'onzz in his standard configuration, before he made his head pointy and started wearing that terrible uniform that he died in. 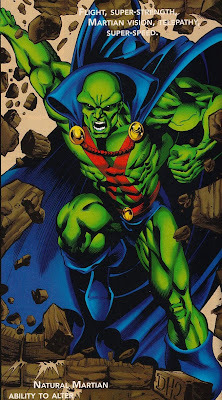 I'm writing these in no particular order, so first up is J'onn in an Elseworlds tale about the JLA, called Destiny (I think that I might have to do little mini-reviews of these things to keep my opinions about them from seeping into the main reviews. In brief, this one is about a world in which there is no JLA: no Superman, no Batman, etc. There are some really neat original characters and I remember liking it enough that I'm not going to spoil it more than I have to. Thoroughly JOHN APPROVED). 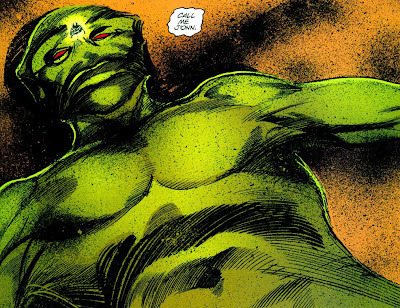 As I recall (it's been a while), J'onn has been half-dead in a desert for years, and is slowly dissolving or something like that. Or maybe it's his mind that's dissolving, since you can see him floating in the middle of the forehead there. 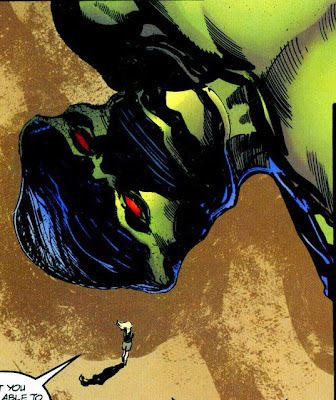 In any case, for the purposes of this story, J'onn J'onzz is an immobile, intangible green giant lying in a desert and conversing with Destiny, the title character. He acts as a sort of informant and clues the good guys into some of what's been going on in the world (if this isn't one of the 52, it should be. It's a damn sight better than that crappy Red Rain universe, I can tell you that.). It's really fun; I wish I could tell you more but there are ethical considerations. Read this one if you get the chance. Oh, he's also really ugly, even for a giant. Even so, I enjoy the creative use of the character - this is the good kind of Elseworld, where it's not just Batman in a pirate outfit (not that that's necessarily a bad time, just that it's not as cool). 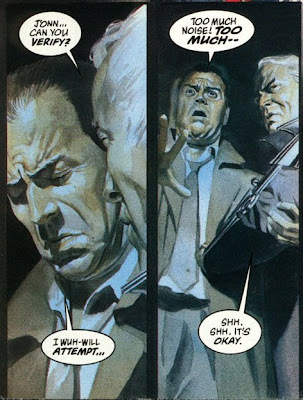 terrific look/sound of surprise kind of makes up for that, but doesn't mitigate the fact that the Manhunter immediately uses his shapeshifting powers to become normal and wreck the whole premise of the thing. Damn internal consistancy. 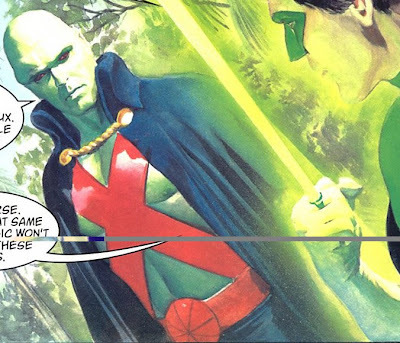 I haven't read this one, but the J'onn-analogue is really creepy looking, so I felt like including it here. Bug eyes and veiny head? ugly is one thing, but this guy is ugly-ugly. 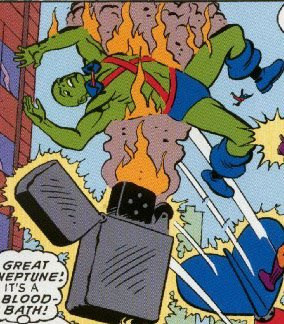 I have a theory about why J'onn ended up this way here (and it applies to his similarly neutered state in Dark Knight Strikes Again): Ross (and Miller) had written his great big epic featuring a conflict between Superman and Captain Marvel (or Superman and Batman's brain), the two most powerful forces in the DCU, and then remembered that there was a third, slightly more green guy floating around in the same weight class. Thus, the telepathic self-lobotomy is born (or the nanotech-to-the-brain. Nanotech that both invalidates mental powers and makes someone all hard-boiled and Sin City-esque). It kind of makes sense, but it's an ignominious end for the noble Martian. 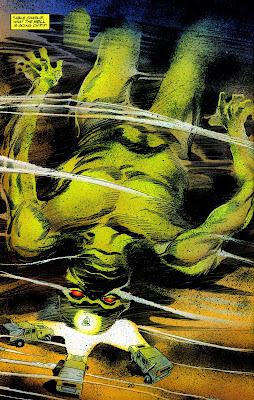 Here's a non-pathetic-looking Ross Manhunter, just for the hell of it. Guh. I'm done for the day. Turns out, though, that I have enough of these pictures for a whole 'nother day of this. 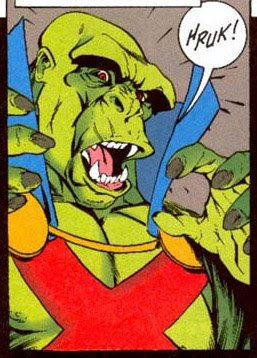 Tune in next time for J'onn J'onzz as a kid, as a cowboy and as a lady!